‘Lorelei’, originally uploaded by the workroom. This is Lorelei. She is the centre piece fabric in an epic Queen-sized quilt that has been ‘in the works’ for over five years. It is also my first quilt. Now that I’ve got my own quilt and fabric shop, I think it’s time to push this project back to the front of the line. I first took notice of quilting years and years ago at ICFF in NYC when I saw Denyse Schmidt’s quilts for the very first time. It was one of those moments when a whole new world opens up before you and swallows you whole. I started collecting fabrics for a quilt that is inspired by a couture quilt that Denyse did for the amazing store Takashimaya made from vintage Kimonos. I collected fabrics for this quilt until last summer when I finally found the last fabric to complete the collection… for the quilt top. I’ll fill you in on the quilt back fabrics later on. I’ll be introducing you to all the other fabrics of this quilt in the next little while. I hope you love fabric as much as I do. Hello, Lorelei! Gorgeous. Look forward to the other selections. Anything Takashimaya-inspired is AOK in my books. My favourite thing about Takashimaya in New York was their flower/garden department as soon as you walk into the store. I wanted to live there. Just curious I have another print called Carlotta do you have a date or periods for the Never Misbehaves? Sandy – no, i was never able to find any info on this fabric. i’d be so curious to see your print. if you track down some info, please let me know and i’ll do the same! my name is Richard and I am currently researching for a book on Artist’s textiles in Britain and the USA from 1940 to 1970.This is due to be published in the Autumn of this year. 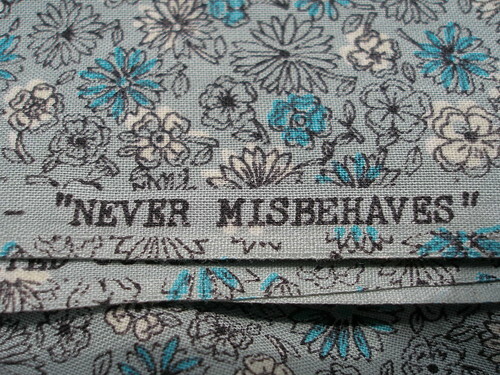 I was intrigued to find your Lorelei fabric had the “Regulated cotton – never misbehaves” details on the selvedge. During our course of study we have uncovered several textiles which seem to be graphic illustrators work, and which seem to date from c.1955. Obviously this company printed pretty florals such as Lorelei as well as the illustrators work. I notice that in one of your close up photos of the selvedge details, there is the name of the company which is partially obscured “?…..cottons inc.” Would it be possible for you to read the full name of this company which would help enormously with researching it’s origins,dates etc. I’m hoping that the details are still readable now its incorporated into your quilt !! 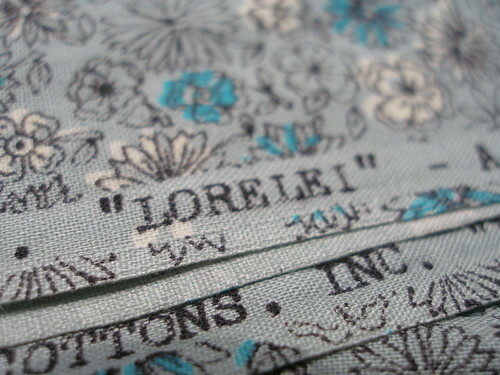 I still have a piece of the ‘LORELEI’ fabric with the selvedge intact. The selvedge reads, ‘Regulated Cottons, Inc. “Lorelei” – A Regulated Cotton – “Never Misbehaves”. I will take a photo for you and send it along. Do you know anything about this company? I’m intrigued by your research and would love to know when the book will be published. Please let me know if you would like further information. I am the owner of the fabric. On the edge its “(C) “Carlotta” A Regulated Cotton – “Never Misbehaves”. I have not used it in a quilt waiting to find out hopefully how great this find is. I have only been quilting for about 4 years and have for the past 2 been attending auctions in a small Iowa town, picking up hand-pieced tops, quilts and some antique blocks. So many projects I started about 6 months ago hand-quilting my first find to help keep it together. I was made during the 1930s-40s with feed-sack and 30s fabrics. I am truly looking forward to knowing what you find out. All I know is this quilt will have a lot of black when I find the right pattern and my eye sight recovers from surgery. Thankyou Karyn and Sandy for your help with the regulated cottons. I will keep you posted with any developments. Brown and yellow-gold paisleys on black stripe with a brown and tan stripe alternating. Here I am in 2015 still waiting for more info on the history of this fabric. I have 3 yards of “Wisteria” A Regulated Cotton “Never Misbehaves” and would love to know if anyone has more information about it.